NHM Kondagaon district. Available vacancies are Dental Surgeon, Ayush Medical Officer (Female), Ayush Medical Officer (Male), Staff Nurse, Pharmacist (RBSK), Lab Technician (RBSK), Lab Technician (RNTCP), Feeding Demonstrator, STLS (Senior Treatment Laboratory Supervisor), STl Counselor, VBD Consultant, Accountant (RNTCP), VBD Malaria Technical Supervisor (MTS), District Consultant, ICTC Counselor and District Program Coordinator (RNTCP). Interested and qualified persons may apply for this NHM Kondagaon jobs on or before 04-11-2017. It is mandatory for submission of application form along with all required documents. Candidates will be selected through document verification and interview. 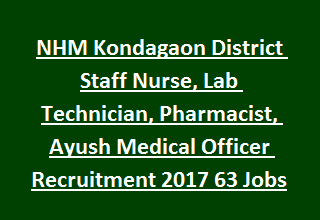 More details about this NHM Kondagaon district Staff Nurse, Pharmacist and other vacancies are given below. As limits as on 01-1-2017 lower age limit is 18 years and upper age limit is 64 years. Refer notification for post wise vacancy details. Candidates will be selected based on merit in qualifications, work experience and skill tests. Merit list will be prepared based on qualifications and experience only. Those candidates only called for final document verification. Computer Skill test will be conducted where ever required. Candidates who are having the necessary qualifications the can submit their application form to NHM Kondagaon district on or before 04-11-2017 along with supporting documents copies of self attested.